The TRANASSIGN procedure provides a batch method for calculating a Profitability Management model. The procedure takes the transaction tables in your input directory, applies rules in the model to make calculations, and stores the calculated results in columns that are appended to your transaction tables in the output directory. Errors and warnings are written to the SAS log file. The PROC TRANASSIGN statement specifies the input data sources for transaction table schema, transaction behaviors, and assignment rules. Note: The following arguments are required only if DIAGNOSTIC= is not specified. If DIAGNOSTIC= is specified, then the following arguments are ignored. ChildOf uses variables from custom dimension tables. See also: Filter by the Value of One or More Dimensions. Match Behavior uses a variable from the behavior table. Formula Char 4096 The driver formula that is used to calculate the driver quantity for a particular assignment; the expression must be SAS-compliant and use variables only from the transaction table. Note: This field is new in Profitability Management 2.1 and is required. Note: This behavior table is not identical to the behavior table that is used by a SAS Profitability Management model. Whereas the TRANASSIGN behavior table contains a Driver field, the SAS Profitability Management model behavior table does not contain such a field. Internally, SAS Profitability Management combines its behavior table with a rule association table to append a Driver field to produce the kind of behavior table that is used by the TRANASSIGN procedure. Returns the version number of the TRANASSIGN procedure to the SAS log. If you specify DIAGNOSTIC=, then any other arguments of the TRANASSIGN statement are ignored. Currently, VERSION is the only value supported for the DIAGNOSTIC= argument. The TRANSACTION statement specifies the input data source for a transaction table. It is also used to specify the transaction type, the period for the transaction table, and the data source for the output table. The statement specifies the action (overwrite or append) when there is a pre-existing output table with the same name. At least one TRANSACTION statement is required for a TRANASSIGN procedure. Specifies the data source for the transaction table. Its schema must match the value of the TYPE parameter. Specifies the period for the transaction table. The period information determines the corresponding behavior rows for the transaction assignment. Specifies the name of the transaction table group to which this transaction table belongs. The transaction table group determines the schema of the transaction table. Every transaction table in a group must share the same schema. The schema for a transaction table group is in the table specified by the TRANSCHEMA parameter in the PROC TRANASSIGN statement. The DIMENSION statement defines the dimensional mappings in the transaction assignment. An assignment rule can use a condition that has an external dimension that does not live in the transaction table. This statement defines the data source for the external dimension table, and the key mapping between the transaction table and the dimension table. The DIMENSION statement is optional for a TRANASSIGN procedure. Specifies the name of the dimension. The dimension name is referenced in an assignment rule's condition. Transaction Data=model.Atm04Q3 Period='2004_Q3' Type='General' Output=modelOut. Transaction Data=model.Atm04Q4 Period='2004_Q4' Type='General' Output= modelOut. The ChildOf function returns 1 when the corresponding dimension member for the current transaction row is a descendant of the member parent_dim_member_full_name. Otherwise, it returns 0. 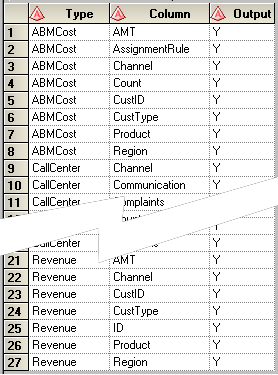 The first parameter specifies the column name of the dimension member in the transaction table. This parameter should not be in quotation marks. The second parameter specifies the full name of a parent dimension member. The syntax of dim_member_full_name is similar to MDX (multidimensional expressions). Square brackets enclose the name of a single dimension member. The full name must start with the dimension name, and it must contain the name of each level for the parent dimension member. This parameter must be in quotation marks. Both single quotation marks and double quotation marks can enclose strings.
"]" is used as an escape character for embedded closing square bracket. A single quotation mark is used as an escape character for an embedded single quotation mark.